We go to see the oncologist who is as cheerful as ever. He tells me that my tumour markers have risen slightly but that is over a 3 month period so he doesn’t know if they’ve jumped quickly or just gradually increased. More blood tests to find out. He also orders a CT scan so we can see what’s happening inside. My biggest problem, as ever is fatigue and the idea that I can do everything I want to without consequences. It’s like I forget every time and then spend a few days in bed recovering and dealing with the pain. My sleep has been weird, too, and I’m often awake for 4 hours or more in the night. It’s a good time to do Christmas shopping but I really would rather be asleep. I finish a couple of books, that way, too. Chemo on Monday is a little different as Mr Mason is away at a meeting in London. I have booked transport to the hospital which turns out to be a man in a car with casual racism and a dislike of anyone moving into the area. We find things to talk about on the journey although it does feel strange to be without Mr Mason, even though he is not allowed in the chemo suite. I am called in quite quickly which is a novelty and am soon plugged into my portacath. The woman next to me starts to feel unwell and goes red in the face. Her heart is hammering away, she says, so we call a nurse over. She is having a new treatment which I guess is Herceptin as it can have those effects, but I’m wrong. We fall into conversation and I tell her we have only recently moved to the area. She says she lived in London until 13 years ago. “Aren’t you glad to get away from all those ethnics?” she asks. I’m a bit taken back and explain that I think that’s the one thing Lincolnshire lacks. She says angrily that she was mugged and burgled before she moved away but she didn’t say the kind of people who did it. I agree that’s a horrible thing to happen to anyone but my experience had been quite different. It wasn’t all sunshine and roses but how we loved the diversity of food shops, being able to buy ingredients for pretty much any nationality and the great international community. Then I drop the bomb. “My son in law is Iranian” I say, “and here it’s more difficult to find ingredients to cook Iranian food whereas that wasn’t a problem in London”. She goes a funny colour and ends the conversation. I just like saying “My son in law” anyway. There is a bit of kerfuffle about giving me Domperidone, the anti-sickness drug. It’s not been prescribed but I am used to asking for more when I need it and here, things are obviously done differently. The staff scurry around and come back from the pharmacy with the medication but unfortunately it’s been made out in a name similar to mine but not mine, therefore I cannot have it. I wait outside for the car driver who tells me he can’t leave until 2 other patients are ready. Eventually we depart at 3.15 and I sit in the back with a lady who, the driver tells me, “don’t speak any English”. Luckily I get dropped off first as the dogs have been on their own since 9am and will be going ballistic. They are mightily excited when I get in, jumping up as if they haven’t seen me for years and Lark has disgraced herself on the kitchen floor whilst Archie has held on. He does have an amazing bladder capacity, similar to that of Austin Powers. The following day we take Lark to be spayed. She is wearing her new red jumper to keep her warm and walks into the vet’s surgery without a care in the world. They make a big fuss of her but when we leave her, she’s confused that she’s not coming with us and I spend the day worrying if she’ll be all right. Anaesthetising a sight hound is a different game to other types of dog due to their large chests (or so I’ve been told). We ring at 2pm and she is fine, lying on her back asking for her belly to be tickled and ready to come home. We go to collect her and she is clearly spaced out. Mr Mason has to pick her up to put her in the car and to get her out again. She goes straight to her crate and sleeps and sleeps, just waking to have tepid scrambled egg spooned into her little mouth. What a princess! Archie spends the day fretting over where his little sister is and gives her a good sniff when she comes home. It’s difficult for him because she can’t run around or wrestle with him and the first time she goes down stairs on her own she is hesitant and gives a little “Oooh” when she gets to the bottom, gravity getting the better of her. For the first couple of days she is clearly in pain but she soon starts to heal up. She doesn’t show much inclination to race around the garden yet. I suspect it feels tight where her stitches are but they come out this week so that should feel better and then they can have a celebratory race around the garden. My new appointment with the speech therapist comes around and we head off to Lincoln County Hospital. When we get there, we just can’t find the right place so ask at reception. They point out that my appointment is at Louth Hospital. Sigh. I cannot be trusted these days to get anything right. I phone Louth and they say they will tell the therapist so we hit the road again and arrive at a hospital which is clearly old (for anyone in Ealing, think the original St Bernard’s) and therefore confusing in its layout. We ask a random woman at a clinic reception desk and she says “It’s by the entrance” which is rather unhelpful as there are lots of buildings clustered around the entrance. We rush off and eventually find the place which I am sure is in the same building as a clinic entitled Sexual Diseases. Luckily our therapist is in reception at the same time as us and ushers us into her office, even though we are 40 minutes late. She is brilliant, taking notes and giving me tips on how not to choke when I am eating and drinking. We make another appointment for a couple of weeks’ time in Horncastle which is much nearer to us. She thinks I should be seeing an ENT specialist, too, so she asks my GP to refer me to one and will be working on my voice, my swallowing and eating. The following day we go off to collect our hedgehogs. I didn’t think we’d be able to home any this year as we left it rather late to offer but the hedgehog lady called and has a mum and 3 babies for us. When we get there, she also has a lone hedgehog called Linda who tried to hibernate in a pub cellar. The rescue centre is a warren of buildings with washing lines full of towels drying. And it smells! We once had a hedgehog who came into the conservatory back in Ealing. It hid away and every time we went into the conservatory, it defecated in fear. We had forgotten the smell! The woman who helps us is clearly devoted to hedgehogs and dogs. She brings the mum and babies out first, telling us the mum was savaged by a badger. She was with them for 3 weeks and when they went to clean her out one morning, found she had 3 baby hedgehogs with her. Clearly uninhibited, she would lie on her back suckling her babies and didn’t mind who came to have a look. I suddenly think, stupidly, that we haven’t brought anything to put the hedgehogs in but we are given a little wooden house with 2 rooms, one with mum and babies snuggled into a towel and the other with a messy white towel where the entrance is. We are told the hedgehogs like the smell so they don’t get cleaned out, as such, but poo is removed and that’s that. Mr Mason will clearly be on poo duty yet again. We are also given Linda in a separate house and told she will likely leave us quickly. The babies might also go as they have been born in captivity and don’t know what the world is like but will probably be very curious. We put them into the car, hoping they won’t prove curious as we are driving home and the dogs look aghast as the smell hits them. They look at each other, silently blaming the other. 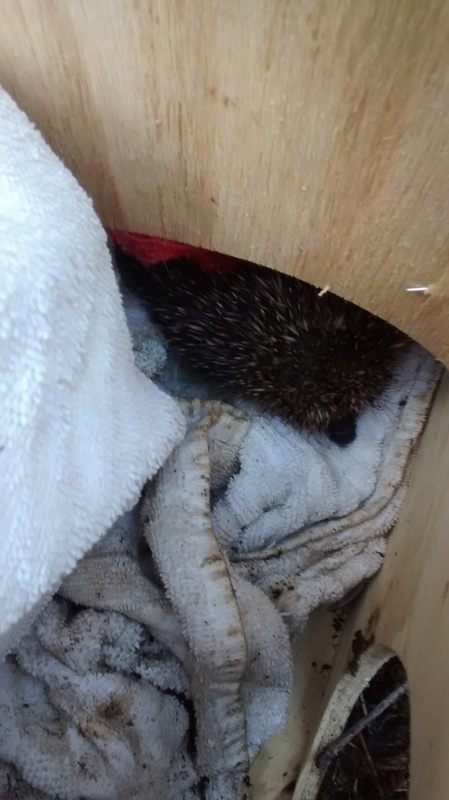 Back at home we put them in the hedgehog hotel we have built and provide food and water and leave them to it, not before taking a quick peek, though. So these are the latest members of the Mason household; Linda, Hilde, Athelstan, Wulfrun and Ethelfrida, all good Viking names (apart from Linda, obviously), in honour of the Viking heritage here. 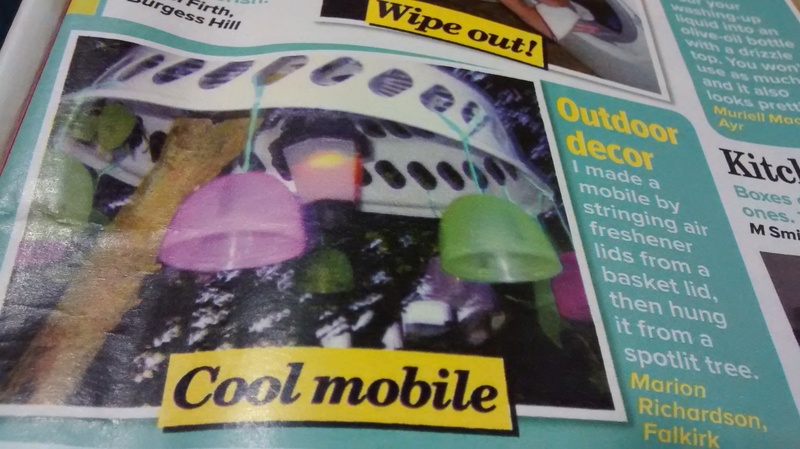 Finally, if you have spare time on your hands, you might like to make this delightful mobile I saw in a magazine at the Hospital. It will amaze your friends and make them green with envy. All you need is a plastic basket lid and the lids from air fresheners, apparently. It is truly unique. I am a 56 year old woman living with secondary cancer. I was diagnosed with Inflammatory Breast Cancer in March 2012, that rarest and most aggressive of breast cancers. Often mis-diagnosed, it presents itself with redness and swelling, a change in the consistency of the breast rather than a single lump. My GP examined me and said it was not cancer but offered me the opportunity to have it checked out at the breast clinic. Fortunately I took this up and so we knew what we were handling with quite early on. My treatment regime was tough – 3 sessions of FEC, 3 of Docetaxel, a radical mastectomy with full node clearance and 25 fractions of radiotherapy together with a further 3 sessions of Docetaxel and a year of Herceptin. Despite Professor Palmieri’s best efforts, I was diagnosed with secondary cancer in the lungs in June 2014. I am on the fourth chemotherapy since diagnosis and it seems to show some effects. A positive CT scan which showed a reduction in lesions was tempered by a prognosis of 12 to 18 months, a lot less than I was hoping for. At the point of the secondary diagnosis, my husband, Mark, and I decided to carry out an ambition we have held for some years and that was to move to Lincolnshire and have a quieter, more rural life. Despite the shock and incredulity of my oncology team, we managed it and moved from West London to a small village in Lincolnshire in March 2015. I am lucky enough to have Mark, who I have known since 1978 and who has stood by me through each medical crisis. I also have 2 adult children – Francesca, who is a practising Birth Doula in Bangkok where she lives with her husband and Oliver, who lives in London and does something important and complicated with computers. They have all been solidly behind me providing love, support, hugs and inappropriate jokes. I love them enormously and dread the day we will all be parted. Since January 2016, we have my mother-in-law living with us after my wonderful father-in-law died. She has dementia, is very deaf but so far refuses hearing aids and has turned our world upside down. We are just starting to come to terms with what we are dealing with and some of it ain’t pretty. So please forgive the swearing, complaining and insensitivity. Life has just changed beyond what we expected – yet again. As for this, this is my blog. It’s about living with secondary cancer and all that entails. Please read and I hope you will find it interesting and helpful or at least, entertaining. All the bad jokes are mine. So Monday is the first day I have my chemo at Lincoln County Hospital. My new oncologist seems a lot sounder than the last in that he will answer questions and doesn’t appear to be having some kind of breakdown. He’s in agreement about being seen every 3 weeks and generally we are on the same page. We get there on time and I am called into the chemo suite just before my appointment time of 11am. Hurrah! They are on the ball and do my observations quickly. My nurse, Laura, asks whether I would mind if she plugs me into my portacath as she is learning the procedure. Everyone has to learn so I say it’s fine. I have had trained nurses take 3 long and unpleasant attempts to hit the centre before and I’m sure she won’t be that bad. She is observed by a senior colleague and happily hits it first time without much pain. A portacath, for those of you who don’t know, is a device sewn into your chest with one tube going into a vein near the heart and the other end sewn into the jugular vein. It’s not really visible apart from the scars where the stitches have been. The nurse feels around it and then inserts a needle into the centre of the port which has a rubbery membrane over it. If she hits the spot, the needle goes into the port and the chemo goes into the tube then the vein. It’s a great system once the incision has healed as there are relatively few risks and little chance of infection, one of the major worries with cancer. So by 11.20 I am wired up and having a saline drip fed through, waiting for my chemo. At about 12.20, the pharmacist appears to ask me about my prescription. He is unsure (he says there is ‘some debate’) about what else to give me. Do I need steroids? NO!! What about anti-sickness meds? I tell him I manage that orally as the nausea is unpredictable and can come on at any time. He offers to give me Ondansetron, a strong anti-emetic with the chemo. I tell him this is unnecessary as I have Domperidone, a lighter version, at home and that this is fine for me. After some humming and ha-ing, he goes away saying he will go and sign the chemo off. I wait. A nice lady brings me coffee and biscuits and a bit later a sandwich. People come and go but I am still sitting there. I just feel more and more upset. I ask the nurses when the chemo will be ready and they check with pharmacy but say it isn’t ready yet and apologise again and again. I ring Mr Mason, who is waiting in the reception, and advise him to go and get a sandwich and possibly let the dogs out of the car as they are waiting patiently for us, the infusion only due to take 30 minutes. By 2.30 I am distraught and, despite my best efforts not to, start crying. A lady sitting next to me alerts a nurse who asks what the problem is. I explain I have been there since 11am and I just want to have my treatment and go home. She promises to go and ring pharmacy again. At 3pm, the pharmacist is back on the ward having a lovely chat with a patient which seems to go on forever. I stand up and stare and stare, willing him to look at me and feel guilty that he hasn’t done what he said he would. If I was not wired up, I would go and interrupt him and ask him what he thinks he is doing. I rarely complain on the wards. The nursing staff work so hard and I know there are things that go wrong which are rarely their fault. He manages to ignore me although he must feel my laser eyes burning into him. Another nurse comes by to apologise and, seeing I am so upset, asks Mr Mason to come in and placate me. I am seriously thinking of just taking the needle out by myself and going home. Mr Mason persuades me this is not a good course of action and goes to let the dogs out once again. I feel angry on their behalf. Eventually, at 3.30 my chemo arrives and the pharmacist has ordered Ondansetron despite our earlier conversation. The nurses call him over and ask how they can override the system as I refuse to have it. He looks at me and says “Hello” without smiling. I stare back and don’t even bother to reply. He blusters that he has to add Ondansetron to the prescription and I repeat I neither want nor need it. He looks at me as though he has picked me up on his shoe and I dare say my face isn’t any nicer. My laser stare wins, I am plugged in and off I go. The actual treatment takes 30 minutes so even with the needle insertion and flushing of the port, the treatment should take no more than an hour. I ask the nurse whether there are very few patients on this treatment as that would explain his uncertainty but she tells me that they have quite a lot of patients on Kadcyla so why he’s been faffing around, I really don’t know. Chemo is finished and a flush is put up but on an incredibly slow drip. After 20 minutes I grab another nurse and beg her to take it down. I am done. It’s all fine. 2 of the nurses urge me to make a complaint. I explain I don’t wish to complain about them as they are doing a great job but they insist I should and that they will not take it personally. It’s next on my list today. We leave the unit at 4.30, 5 and a half hours after I arrived for a 30 minute treatment. I feel exhausted, wired and just want to get home. Driving away from the hospital we are almost immediately in countryside which is really quite soothing. It’s a very different drive from the one home from Charing Cross. I see a sign advertising guinea pigs for sale at £9 each. I tell Mr Mason “Guinea pigs for sale, £9 a kilo”. “Really?” he says but I can’t keep the cruel joke up and tell him it’s really £9 each. Then it sets us off wondering whether it would be better value if it were per kilo. It depends on whether you are going to eat them, I suppose. Everyone knows how tiring and stressful moving home can be. I just want to add the weight of my voice to that. Oh, it is SO tiring and SO stressful. Even the most simple thing like getting electricty connected to the house for the day we move seems a trial. Our address does not exist. We are quite happy to stay with the company who currently supply us with electricity but they want to connect us to a house called Castle View when we will be Castle House. I don’t imagine the owners of Castle View would be too happy to wake up and find we have changed their electricity supplier. How can we get round this? We need either the number our house occupies in the road or the serial number of the electricity meter. Once again, our vendors are proving tricky to get hold of. In the week we are due to exchange contracts, they go to ground and don’t respond to texts or emails. As they live in Saudi, telephone contact is not really going to happen. They give information about replacement windows which is, well, not correct shall we say, and this means they will have to provide an indemnity policy should the local authority decide to penalise us over this. They are not only uncontactable but seem to have forgotten to instruct their solicitors to exchange contracts once everything is ready. Cue rush of blood pressure and our buyers in tears. We suggest the buyers might like to come over at the weekend to ‘measure up’ so we can reassure them that we really are planning to move. They are distraught, their solicitors having told them that exchange will happen “tomorrow” for several days. We share complaints and they leave feeling reassured. On Monday, at the point where we have decided WE will pay for the indemnity policy, our vendors resurface and with just 6 minutes to go before the end of the working day, we have exchanged contracts. A bottle of champagne is put into the fridge by Mr Mason and I delay taking pain medication as long as I can so I can enjoy a sip. I bite the bullet and arrange for Sky to supply us with tv, internet and phone, despite my better judgement. The following day we cancel our service with Virgin Media only to be told we will have to pay a disconnection charge of over £200. We have been with Virgin for many years and this seems wrong, especially as the ‘disconnection’ does not involve anyone physically doing anything like coming to the house. I speak to the Customer Services man who says if he could waive it he would but he can’t. He urges me to complain by writing a letter but I would rather use social media so I tweet and Facebook outlining my complaint. Within minutes I have a response and by the end of the day they have withdrawn the disconnection charge and apologised profusely. It’s at this point that the fibromyalgia really seems to flare up, leaving me in more and more pain, making it difficult to get comfortable and leaving me very, very tired. It is difficult to stay awake past 8pm and I certainly don’t want to get up before 10am. My day is shrinking dramatically with so much to do. Nearly every plan I have to meet with friends before we go is postponed or cancelled. I really am finding it hard and, with such a short day, I still need a nap in the afternoon. My friend, Ms Marsden, often refers to me as Mrs Dormouse and I really think the dormouse is making a comeback. We are still sorting through the last few areas which haven’t been looked it. It’s hard to know what to do before the removal men come and what to leave for them to do. The moving and all its attendant needs are happening alongside the usual medical and hospital appointments. This week it is oncology, a CT scan (to check whether the current treatment is working – slightly scary) and chemotherapy. The removal men start packing on Friday morning, the same day as chemo, and will then continue on Wednesday and Thursday next week, delivering half our posessions on Thursday and the final load on Friday. Yes, it’s Friday 13th. Why – do you want to make something of it? Last week I manage to arrange a pre-operative assessment for myself. Yes, I know the hospital should do that for me but sometimes you just have to take things in hand. I had a pre-op assessment in October just after I came out of hospital following my extreme toxic reaction to Lapatanib and Capecetabine. The anaesthetist at this meeting feels it would be better to wait until after the wedding to have surgery which, given that I can barely stand, seems like a good idea. Since then, the surgery has been listed twice and cancelled twice. The last time, the surgeon phones to apologise for the cancellation and I mention during our conversation that I need a pre-op assessment. He agrees I sound breathless and says he will arrange it. Cue tumbleweed. Once I am in receipt of the new date, I phone to ask about an assessment, explaining that my breathing is not always good and that they are going to Knock Me Out and so, finally, it is arranged. As usual, it is squashed in with other appointments and after seeing the oncologist, a drink in Maggie’s and a sandwich in the restaurant, I make my way to the appointment. The nurse I see, Joyce, is lovely and goes through all the details with great diligence. I still have to explain about the cancer in my lungs, though, so she gets me to test my breath and writes the number down. “Is it good?” I ask. She is not sure so we will go and ask her manager. And what a ghastly woman she is. From the moment we step into her office, she behaves as though we are questioning her judgement rather than asking her opinion. She is defensive to the point of rudeness and I even have to say I am not being critical, just wanting to know if everything is OK for surgery. I explain my oncologist is concerned I will not be able to lie flat to which she launches into a rant about how I will have a tube down my throat maintaining my breathing so why am I worried about that? Every question and concern is swatted away like an annoying fly and I am taken aback by her rudeness. She is critical of my nurse’s concerns, too, and is really just very offensive. We leave with Joyce rather flustered and me feeling rather angry. Joyce has wanted me to see an anaesthetist so that we will both be happy but her horrible manager says that’s rubbish and we don’t need to do it. I have just got outside the hospital when my phone rings. It is lovely Joyce who says if I can come to the department on Friday before chemo, I can see the anaesthetist. Joyce is going on holiday to see her family in the Philippines this week and wants to have me safely sorted before she goes away. This is nursing care and the NHS at its finest. The following day I am seeing my Inflammatory Breast Cancer chums. I have never met anyone before who has had the same cancer so this is a big day and we spend our time together by talking and then talking some more, interspersed with me getting a radioactive injection in preparation for my bone scan. Bone scans I Do Not Like. It’s the claustraphobic feeling, the plate being just a couple of inches from my face and my hands tied so they don’t move or slip off the table. The main scan takes 20 minutes so I decide the scan of my head will take 5 minutes and close my eyes, counting seconds until I reach the magical 300. Only then can I open my eyes and see the plate is further down my chest so I feel marginally less panicky. This is the worst bone scan, though. I feel at times I could just flail about, crying and screaming and the pressure in my chest feels immense through sheer panic. But I manage to stay still and do what is needed. After the initial scan, the doctor decides to take more images of my neck, shoulders and upper arms where I feel most pain. This means 2 plates rotate around me, sometimes directly over my face, sometimes not so I decide just to keep my eyes shut throughout and concentrate on breathing evenly. I should get the results some time this week. Friday sees me at the Young Women’s Group at Maggie’s and then meeting my school friend, Mrs Palmer, who has driven up from Hampshire to sample the food in the hospital restaurant and accompany me to chemo. I tell my friends they will recognise her because she will be wearing something with Winnie the Pooh on it and she almost disappoints until she whips out her umbrella and there the little chap is. After lunch we go to see the anaesthetist who runs through lots of questions and gets me to open my mouth wide, then pull my bottom teeth over my top lip before finally making me turn my head from side to side and up and down. I ask her if she can tell me anything about the operation to which she says “No” very firmly. She just does the Knocking Out. We see Joyce on the way out and she gives me a sticker to get some blood taken in the chemo suite. I tell her how rude I think her manager has been and that it was uncalled for and unprofessional. She gives me a hug. I stick my tongue out at the manager’s office door and we feel we have dealt with it. In the chemo suite, the nurse misses the hole in my portacath the first time requiring a bit of further stabbing which, I have to admit, is quite painful and results in a bruise. But the blood is taken and then I am pumped full of different liquids while Mrs Palmer and I talk about our families and Jimmy Savile. Having been reading the Dan Davies book, I want to discuss him and how he managed to get away with abusing so many people of all ages for such a long time, often in plain sight. Chemo finishes and the weekend commences with poor sleep, nausea and lots and lots of itching. I have found there are very few places that don’t itch on Kadcyla and the itchiness continues for some days after treatment. Fortunately the headaches recede somewhat and I am hoping the bone pain will also prove to be Kadcyla-related and will also recede. And if the itchiness could also disappear, I am sure I can manage the fatigue that creeps up and bowls me over. The weekend is good with visits from Mr Mason jnr and Ms Atherton and phonecalls with Mrs Fearnley and Mrs Safaie on Sunday. I take the opportunity to talk because, as of tomorrow, I think I will be silent for a while. Having no information from the hospital about the surgery and what it will entail, other than a widget (my name for it) which will be put in my neck, I surf the internet. Some patient information sheets tell me I will not be able to speak for a week and should make sure I have a white board or notepad to write things down. Others tell me I will be able to speak only as strictly necessary. This throws up a whole new range of thoughts as to what is strictly necessary. Asking for a drink or just alerting people to a fire? It’s a wide spectrum of possibilities. One information sheet tells me I will be woken during the operation so the surgeon can ensure I have the right kind of voice. I don’t wish to wake up sounding like Frank Bruno, should this be a possibility. I may go home the same day or I may have to stay in overnight. Oh, and the widget may be made of Gore-tex. It’s a confusing blend of things that may or may not happen. So, tomorrow, following an itchy night, I will present myself at hospital at 7.00am to find out what they will do and whether I will like the sound of it. Having my voice back will be good but being able to cough properly and not choking over food and drink repeatedly will be even better. On with the Sound of Silence. Having cancer is a bit like having a rubbish job where you have meeting after meeting and no time to assimilate or get on with other work. The good thing is that there is sometimes time to see friends and skip off to a greasy spoon for a big breakfast which is what we do with my friend Ms Wengraf, milliner extraordinaire. I find she has had her hair cut into something resembling an urchin/elfin creature and looks stunning. It really suits her, as does the wonderful coat she has acquired through dubious means. We stuff our faces with bacon, black pudding and hash browns and thoroughly enjoy ourselves. But we then have to rush off to St Mary’s Hospital to see the psychologist who agrees we can stop seeing each other. Since coming out of hospital after the September Fiasco, I feel emotionally very well although physically still weak. My right hand and foot have patches of numbness and I wonder if there are other numb areas within my leg which cause the incredible weakness. Climbing stairs still presents a real challenge which I thought I would have overcome by now. Talking to the oncologist, she explains the steroids cause muscle weakness in my arms and legs which also explains why I can’t put my arms fully over my head or scratch my shoulder (such an agony, only relieved by Mr Mason under strict direction). My voice is still weak and weird. The vocal chords are paralysed on one side (have I said this already? Blame it on the chemo brain) so I will have an operation to insert a widget (my word) into the cartiledge in my neck which will give me my full vocal range back but we are going to do this when I get back from the wedding. Operations and flights don’t seem to go well. Thinking about the possibility of draining fluid from my chest, one of the registrars mentions that surgery done recently can suddenly pop open under pressurised cabin conditions. Hmm. Not something I would like to happen so we decide to postpone it. While out recently without supervision from Mr Mason, a rare event, I receive a phone call from the estate agent and phone home to let him know. He is also out and I leave a message on the answerphone. Later on when I get home, I look at the answerphone and press play to hear the messages. The first message I can understand. The second message is quieter and rambling and appears to be left by a nutter who is incoherent and babbling. After listening to it three times and increasing the volume, Mr Mason appears at my shoulder and says “You do know that’s you, don’t you?” My voice is so unfamiliar and quiet I don’t recognise myself. It’s a bit like seeing myself in the mirror. I nearly always do a double take, so regal and Henry VIII is my face. This has caused disagreement and even disappointment for some, like Ms Frumin who visits us yesterday and feels I have over-sold my Holbein features. You just cannot please everyone. This week has been an important one in terms of tests and staging. On Monday I have a CT scan which actually goes well. The canula goes in first time and the appointment is early which allows us to go and visit the Mason in-laws. This is a tricky visit as we are trying to persuade Mrs Mason senior to have a flu jab. She is resistant to all suggestions and there are obviously health issues which I won’t discuss here which need attending to. It is a challenge to get anything done because the default position is always NO. However, we make some progress when both Mr Masons call the GP and it appears something is going to be done so we drive home slowly through the pouring rain. On Tuesday, I have a ‘fit to fly’ test booked at Hammersmith Hospital. I have no idea what it involves but find out I have to wear a tight mask, like a pilot’s, for 20 minutes in reduced oxygen to see if my sats are good enough. The mask is quite claustrophobic and the technician has to take arterial blood from my earlobe 3 times during the test which involves smearing it in Deep Heat and then cutting it with a scalpel. Happily, my sats don’t fall below 84 which means I will not need oxygen on the flight. This is incredibly cheering as it wasn’t long ago even making the flight was uncertain. Following this, we decide to go and get our eyes tested. Oh yes, we know how to have fun. Chemotherapy is not good for the eyes. It stiffens the retina and I have been having problems with reading and even watching tv at times. The bossy woman who was there a year ago spots me immediately. She is obsessed with designer frames while I have no real interest in who designed them as long as they look good. After my eye test, one of the assistants comes to help me. With surprising speed, the designer-obsessed assistant intercepts her and says she is going to help me as she did last year. Oh, here we go. I am looking at frames which appeal and she is straight onto the designer frames. She tells me I like designer frames while I say quite forcefully – well, as forcefully as someone whispering can – that i don’t care at all about designer frames. She clearly blocks this out and determinedly looks at all the designer stuff she can lay her hands on. She is determined to know me so well she tells me what colours I like and what sort of arms my glasses should have. Sigh. I try to plough through designs I like while she shoves endless designer pairs in front of me. Eventually, she finds a Gok Wan pair I actually like so I choose those together with another non-designer pair. Actually, everything is designer because it doesn’t just appear magically fully formed. And the idea that Gok Wan actually sat down and designed these particular frames is really quite unlikely, I think. Anyway, i like them and then have to go through the eye-watering process of seeing how much everything will cost. But at least I will be able to see. Today I see the oncologist to get the results of the ct scan. The nurses in the clinic are lovely and I receive at least one kiss and hug. Even the receptionist seems to know my name which I find amazing with all the patients who pass through. I need to be away early as I have a meeting at the LSE at 1pm and despite my appointment not being until nearly 11, they are on board and hurry me through. The report doesn’t seem to be with the scan pictures but the oncologist looks through them and says she doesn’t think it is as bad as before. It’s hard to tell as there has been no consistent chemotherapy but as there is no increase in the fluid in my chest and my sats are good I take it all as a good sign. And I look and feel so much better than I did on oral chemotherapy it’s hard not to be optimistic. So, until anything else turns up, that is exactly what I am going to be. People all around me have chins. Nice, defined chins and necklines and they have mouths which are normal sized. Oh, and a lot of them have hair. On steroids to help my breathing, my face is swollen like a balloon. I receive a copy of a letter from my consultant to my GP in which she says my face looks ‘Cushingoid’. I look it up and it’s not a pretty description. Steroids choose which bits to inflate and they include my torso and feet which resemble 2 little pig’s trotters. I appear to have lost my ankle bones. So I envy those with neat chins, hair and ankles. This represents an awful lot of the population. Following the horrendous events of September, I feel much better. I am weak – going up and down stairs is still difficult and getting in and out of the car and the shower requires a lot of concentration – but I actually feel in a really good place emotionally. I have my trusty wheelchair which Mr Mason is in charge of pushing. He is a little on the kamikaze side and I have scars on my shins to prove this. In shops we are a little like Lou and Andy. I still can’t speak loudly and Mr Mason pushes me around while I wave my hands and try to make him stop. I am getting quite adept at moving myself around so when he leaves me in one aisle while he goes off to source something, he returns he finds me gone. What a little minx I am. The chemotherapy, although stopped, is still making itself felt. My skin is starting to detach itself as though I have bad sunburn. My legs are actually sore and I can only wear soft clothing. A few of my nails are also making a break for it, deciding they would like to detach themselves and start a new life elsewhere. They bleed and are sore, needing constant moisturisation. The soles of my feet are numb which makes putting shoes and boots on a bit of a challenge. The palms of my hands are also a little on the numb side but I am assured all these effects will decrease and cease altogether in time. This I look forward to. On getting home from hospital, I find I have broken a tooth. Dentistry is not compatible with chemotherapy so I am in a hurry to get a crown or something to seal the tooth off. Suddenly, there are lots of things I have to do. My eyes are worse so I think I need a new prescription for glasses. Chemotherapy stiffens the lens which will never recover. When I am tired, I can’t read and even the tv looks blurry. But I have lots of visitors which is lovely. Suddenly I feel more sociable and people turn up for coffee and entertain me for an hour or so. My diary is full of appointments and work which I intend to try and continue with. The ENT consultant is still keen to put a little widget in my neck which will help with my vocal chord paralysis and give me my voice back so I have a pre-op appointment to see if I am fit enough. It is a general anaesthetic so it’s touch and go whether I can have that or not. I have been very excited about having a henna crown. A friend who is organising the fabulous woobs exhibition says she knows someone who is looking for a model and I am put forward. On Friday I hear they already have someone but ask me to send a photo and a phone number and they will see if they have time to do another on the same day. After I send the photo, I am told they don’t have enough time. Hmmm. Could this be the curse of the steroid Holbein face? I try to persuade myself this is not the case and they do say I am top of the list for the next one they will do for their charity work. I am officially disappointed, though. They are beautiful and I am wondering if I could get one done before the wedding as an alternative to a ‘mother of the bride’ hat (which I am not going to wear anyway). I will have to investigate although the amount of work involved probably means it will be an expensive acquisition. But it might be an antidote to the Holbein Henry VIII look – I can’t imagine Henry ever indulging in such a radical look.